Let’s hop right to it. A rookie match to begin the show, to the surprise of no one watching at home. Azumi Army is in their full form for the show as they go up against three young wrestlers (including two children). Yoneyama and Lee are the lone veterans in the match, giving the Azumi Army a big advantage going into it. Yoneyama and Starlight Kid kick things off, Yoneyama gets the advantage over the much smaller rookie but they trade quick trips before returning tot heir feet. Nanase and Natsumi jump Yoneyama from behind and all three attack her in the corner before connecting with a triple dropkick. 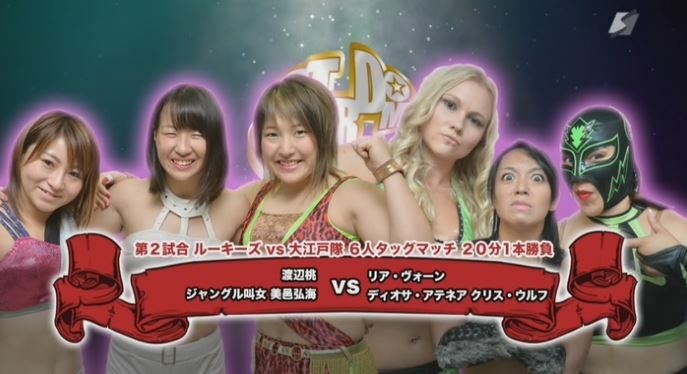 Starlight Kid tags Natsumi but Yoneyama avoids her dropkick and she poses with her teammates on Natsumi in the corner. We clip ahead to Azumi and Nanase in the ring, suplex by Azumi but Lee kicks Azumi by accident when she tries to kick Nanase. Azumi is double teamed by Natsumi and Starlight Kid, but Yoneyama breaks up Nanase’s cover. Blockbuster by Nanase to Azumi, but Yoneyama breaks it up again and then hits a crossbody on both Natsumi and Starlight Kid. Yoneyama tags herself in but Nanase avoids her running senton and she is attacked by Starlight Kid and Natsumi. Nanase applies a submission to Yoneyama but Lee breaks it up, running senton by Yoneyama to Nanase and she gets the three count! Azumi Army wins! A bit clipped and a run of the mill Stardom opener, but not a bad match. Yoneyama gave the youngsters some offense which is always nice to see, and of the little bit we saw there weren’t any issues. Decent way to start, even though I feel like I’ve seen this match 20 times already in 2016. Now it is time for the Oedo Tai B Team (I say that with affection) against more rookies! This is the more goofy/fun loving side of Oedo Tai, yes they may cheat occasionally but they just want to have a good time. They face off against a trio of rookies, including the baby Momo and the surging rookie in Kyouna. They start the match with a brawl, as it normal in Oedo Tai matches, but things settle down with Wolf and Momo in the ring. Atenea tries to help but Wolf dropkicks her by accident, and the rookies all attack Wolf while she is in the ropes. Everyone runs into the ring as Oedo Tai takes back over, suplex by Wolf to Momo and they stack all three rookies on top of each other. Wolf keeps the attack up on Momo as she hits a strike in the corner, then we clip ahead to Atenea in the ring with Kyouna. Atenea clubs Kyouna in the back of the head but Kyouna hits a powerslam for two. Leah and Mimura are tagged in and they trade elbows, Leah gets Mimura to the match and she hits the Lionsault for a two count. Mimura avoids Leah’s boot in the corner and rolls her up for two, she goes for a crossbody but Leah catches her. Momo dropkicks them over as she and Kyouna come into the ring, and Leah is double teamed. Kyouna then picks up Mimura and powerbombs her somewhat onto Leah, and Mimura covers Leah for two. Atenea and Wolf come in the ring, Momo tries to hit a missile dropkick on them but she accidentally hits Kyouna. Leah gets Mimura on her shoulders but Momo and Kyouna block Atenea and Wolf from doing whatever they had planned to do to her. Mimura sneaks in a quick pin on Leah for two, elbows by Mimura but Leah decks her with a spear for the three count! Oedo Tai win the match. I like these types of opening-style matches, as it mixes a few different elements together. Leah continues to impress me, I hope that she comes back to Stardom one day as she really has her character down pat and works well in Oedo Tai. The rookies here are above what I’d consider your typical rookie tier, and wrestle as if they are on the same level as wrestlers much their senior which makes for a better match. A bit too clipped to get super excited about but a solid match and a good showcase for all six wrestlers. Oh boy, this is how I know there is a God, I get to watch this match clipped. Both Chelsea and Shanna have had a rough go at it recently. Chelsea is a bit awkward in her movements still, while Shanna had a subpar showing against Io Shirai and then didn’t finish her match against Momo after getting a small cut over her eye. They have a lot to prove here, let’s see if they can surprise me. The match begins pretty politely with tie-ups and limb work (they have a lot of time to kill), some of the exchanges are a bit rough but they are trying. Shanna gets Chelsea to the mat but Chelsea hits a monkey flip and hits a running elbow in the corner. Shoulder tackles by Chelsea but Shanna returns fire and and downs Chelsea with a flipping neckbreaker for two. Shanna goes for a suplex but Chelsea mostly reverses it, kick by Chelsea but Shanna superkicks her back. Leg trip by Shanna and she punts Chelsea in the face for a two count. Shanna goes up top but Chelsea grabs her and hits a modified atomic drop followed by a bridging vertical suplex for two. They get back up and lariat each other, they both go for crossbodies and collide before flopping to the mat. Chelsea goes up top but Shanna recovers and joins her and pushes Chelsea to the mat. Diving footstomp to the back by Shanna but the bell rings, signifying time has expired. The match is a Draw. Sadly, they did not surprise me. Half of this match was cut out of the Samurai TV broadcast and it still wasn’t a good match. Just lots of awkwardness… things ranging from armdrags to reversals just were not crisp at all and there were multiple times that the moves looked stiff and not smooth. Both were trying hard so I will give them that, but there wasn’t a lot to like here as they just didn’t have any chemistry to speak of. Not sure why they made people sit through 15 minutes of this, a cruel joke by someone for sure. Best to just skip this one. Matsumoto continues her reign of terror over the rookies, as she faces the young Actress girl’Z wrestler in Anou. Anou has not been around as much lately but clearly still has a role in Stardom, as she gets a big match here against one of the top Freelancers in Joshi. Anou tries to attack Matsumoto before the match starts but it quickly backfires as Matsumoto takes over and works the headlock. Anou gets out of it and hits a few elbows but Matsumoto sends her to the mat with a shoulderblock. Back up they trade strikes again until Matsumoto hits a DDT, running boot by Matsumoto and she covers Anou for two. Matsumoto goes for a lariat but Anou bridges down to avoid it and rolls up Matsumoto for two. Backslide with a bridge by Anou, but that gets a two count as well. Figure four by Anou but Matsumoto gets out of it and reverses it into her own figure four. Anou eventually gets to the ropes to force a break, Anou avoids Matsumoto’s charge in the corner but Matsumoto boots her to the mat anyway. Matsumoto gets on the second turnbuckle but Anou recovers and hits a fisherman suplex hold. Anou rolls Matsumoto up to go for another one but Matsumoto reverses it into a vertical suplex. Hard elbow by Matsumoto and she drops Anou with a backbreaker from her shoulders for a two. Matsumoto gets up on the second turnbuckle and nails the reverse diving double kneedrop, and she picks up the three count! Matsumoto is your winner. After four long years, the Ace Candidate has returned to Stardom! I for one am really excited for Yoko Bito’s return, Bito retired due to injuries (as the story goes) in the fall of 2012 but has come to Stardom to reclaim her place as future ace. She doesn’t get an easy match to ease back into things, as she faces off against the holder of two titles and the Pirate Princess – Kairi Hojo. After some armlocks as Bito works off some of the rust, things get serious as Bito shoves Hojo hard to the mat after a knuckle lockup. Kicks to the back and chest by Bito, Hojo goes off the ropes but Bito catches her with a high kick which sends Hojo out of the ring. She returns after a moment but Bito quickly puts her in a stretch hold before letting her go so she can kick Hojo hard in the back. Crab hold by Bito, but Hojo gets to the ropes to force a break. Back up they trade elbows until Hojo levels Bito with a spear for a two count. Chops by Hojo in the corner and she hits her jumping neckbreaker for another two. Leglock by Hojo, but Bito crawls to the ropes to get the break. Hojo goes off the ropes but Bito catches her with a lariat, she goes up top and she hits a missile dropkick for a two count. Suplex by Bito, she goes for a high kick but Hojo blocks it and delivers a backfist for two. She goes for the Sliding D but Bito catches her with a heel kick and the duo trade elbows as they return to their feet. Hojo wins the battle and hits the Sliding D, she goes up top but Bito gets her feet up when she goes for the diving elbow drop. Heel drop by Bito and she nails a high kick on Hojo for a nearfall. Bito gets Hojo on her back to go for a reverse piledriver, but Hojo gets out of it and goes for a Stretch Muffler. Bito kicks out of that and kicks Hojo some more, but Hojo catches her with a spear for a two count. Spinning chop by Hojo, she goes up to the top turnbuckle but Bito recovers and hits a high kick. Bito joins Hojo up top but Hojo knocks her into the Tree of Woe and nails a diving footstomp. Hojo then goes back up top, she delivers her diving elbow drop but Bito barely gets a shoulder up. Hojo goes right back up top and hits a second diving elbow drop, and this time she gets the three count! Kairi Hojo is the winner. This match is for the Goddesses of Stardom Championship. Thunder Rock came into this match having held the Goddesses of Stardom Championship for over 400 straight days, the longest reign in the history of the titles. Shirai and Iwatani are the top two wrestlers in Stardom and are incredibly hard to pin, making beating them a very difficult task. This is Oedo Tai’s third try to win a Stardom title in the last month, with Kagetsu personally being 0-2 in those shots. This may be their last chance, and Oedo Tai really needs to find a way to dethrone the champions if their faction is going to continue to be seen as a threat. Iwatani and Kagetsu start the match for their respective teams, armdrags by Iwatani but neither gets a clear advantage as they are very familar with each other. They tag out, Kimura blows on Shirai so Iwatani tags herself back in. Kimura and Kagetsu take turns kicking Iwatani but Iwatani avoids one of their charges and hits a double split-legged armdrag which sends both her opponents out of the ring. Shirai goes to do a dive but Kimura hits her in the head with a pan while Wolf pulls Iwatani off the top turnbuckle to the floor. They battle around the ring but after they return, Shirai takes back over with a double crossbody. Kagetsu and Kimura fall out of the ring again, and this time Shirai jumps out onto them with an Asai Moonsault. She tags in Iwatani, Iwatani goes up top and hits a missile dropkick on Kimura. Northern Lights Suplex by Iwatani, but Kimura reverses it into a grounded front facelock. Kagetsu keeps Shirai busy but Iwatani rolls to the ropes and forces a break. Kagetsu comes in with a parking sign and hits Iwatani in the head with it repeatedly, Shirai comes in but the referee has come to his senses and stops Kagetsu from hitting Shirai with it. Kimura hits the referee in the back with a chair, but Iwatani has the chair in her hands when he recovers so he thinks that Iwatani hit him. Kagetsu then hits the referee from behind with another sign, she then hits Shirai with the parking sign. All of Oedo Tai come into the ring and attack Iwatani in the corner, big spear by Leah Vaughan and Oedo Tai celebrates while the referee is tended to outside the ring. Iwatani continues being assaulted by five wrestlers while Shirai and the referee are hurt outside the ring, Oedo Tai retrieve Shirai as a new referee comes down, he gets in the ring and restores order, kicking all the weapons out of the ring. Iwatani and Kagetsu trade strikes until Iwatani levels Kagetsu with a superkick, more kicks by Iwatani but Kimura kicks Iwatani from the apron. She gets in the ring and Kagetsu hits a swandive missile dropkick. Shirai comes into the ring with a swandive missile dropkick of her own before she sails out of the ring onto Kimura with a tope suicida. Kagetsu throws Iwatani into the corner but she springs up to the top turnbuckle and jumps down to the floor onto Kimura with a plancha. Shirai gets in the ring with Kagetsu while Iwatani goes up top and they hit the assisted piledriver, dragon suplex hold by Iwatani but Kimura hits the referee to break up the cover. Iwatani picks up Kagetsu and goes for the super dragon suplex, but Kagetsu blocks it and hits an Ebisu Drop for a two count. Shirai palm strikes everyone, she picks up Kimura to go for the assisted piledriver but Kimura reverses it while Kagetsu hits Iwatani with a parking sign. Kagetsu joins Iwatani up top and nails an avalanche Ebisu Drop, cover by Kagetsu and she gets the three count! Kagetsu and Kimura win the Goddesses of Stardom Championship! As far as in-ring action goes, this wasn’t the best Stardom ‘big event’ from 2016, but it did progress some important storylines which Stardom desperately needed. Oedo Tai finally won some titles as they hold the Goddesses of Stardom Championship, and the return of Yoko Bito is huge for the promotion if she can stay active and keep going at a decent pace. Since I watched the Samurai TV version the matches were clipped, but I think I got the most important parts. I still wouldn’t mind if Stardom mixed up the first part of the card a bit as it is getting somewhat repetitive, we’ll see how things go the rest of the year. A solid event from Stardom, not a high end one but the last two matches should be seen by any fans of Stardom.